So, yes, this year’s Nineworlds then… Last year was awesome, having all the things I like about Eastercon – the varied tracks, the cosplay, the fun workshops – but with an extra bit of buzz that made it my favourite con of the year. This year, excepting the dodgy service in the hotel, exceeded that. Nineworlds is a very friendly con, and one that actively welcomes as many people as it possibly can; catering to a wide range of needs through communication badges, priority seating and as many other accessibility options as the excellent committee bods can think of. And if they haven’t already got it covered they’re very open to sorting things out once someone’s drawn their attention to it. And it’s this attitude, I think, that helps makes the con feel like such a relaxed and cheerful place. The Radisson hotel, however, was distinctly unfriendly towards con peeps. This isn’t new – over previous conventions at the hotel there’s been a very noticeable shift in attitude towards con attendees over the weekend, most especially from restaurant and bar staff who will ignore anyone wearing a con badge, yet venture in unbadged and they couldn’t be more friendly and helpful. Which is a shame, because I’m quite fond of the hotel as a place generally. 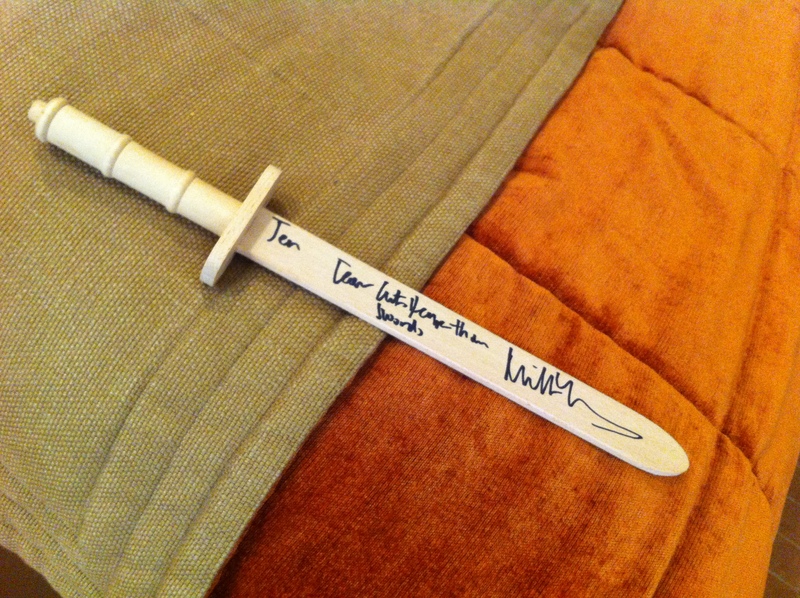 Fortunately Nineworlds has wisely chosen to shift venues next year, so here’s hoping the new hotel has nicer staff. Another thing I really like about Nineworlds is the programme app. With so many tracks on offer, it can be a bit overwhelming sorting out what you’re doing when, but the app makes everything oodles easier. Especially when it comes to spotting triple bookings. 🙂 Now if they could just include a time-turner facility, I might get to see alllll the things as I missed a ton of things I wanted to do and a ton of people I wanted to see. Och well. On the plus side, I saw people I wasn’t expecting to and had all manner of interesting conversations which made up for it. Panels, then. Due to overwhelming demand, many of the panels got packed out early, so getting there twenty minutes in advance was essential in some cases. The Friday myth panel was case in point with people getting booted out due to way too many people sardining in. Also Joanne Harris talked briefly to me before the panel and I totally did not fangirl. Honest. (She’s so cool!) Ahem, yes. Annnyhoo. Which I’ve already booked in for, because, really, that much awesome, you have to, don’t you. (Booking open here now! Doooooo it! You know you want to!) So huge thanks to the con volunteers for making it such a great weekend and here’s hoping that next year is even better! Climbing slowly out of the mire… mostly due to this current and last OU module being the most challenging I’ve done yet so occupying alllll of my brain since October. Fortunately I’ve only got two more assignments left then the course is done, the degree is done, et voila a happy dancing Jen. I had a review of Stephen King’s The Dark Tower up on the fabulous King for a Year project site thing. As King is one of my go to genre comfort reads, I was dead chuffed to be involved. They’re doing King books all through the year so go check them out here! Short version: OMG!OMG!OMG! That! Was! Awesome! Well gosh, that was fun. And if ever there was a convention that needs a lot of photos taking during it, it’s Geekfest. Alas, I took none. So you’ll just have to take my word for the fact that there were so many cool costumes! Harley Quinn, Dr Who and Ace, baby in a flying saucer pram, Judge Dredd, assorted manga type people, Daenerys, a Sharknado…! And panels. Good lord, were there panels. About a million of them, with a handy digital programme thing to make it easier to sort personal scheduling out. Missed a load I wanted to go to because they clashed with other ones I wanted go to a bit more. I need a Time Turner for next year, I think, so I can see all the things. But what I did see – well, there was the Urban Fantasy panel, of course, which I live tweeted due to the perplexingly small amount of women being mentioned as having written urban fantasy and/or city based fantasy. There’ll be a blog forthcoming on that shortly, I think, as there’s a lot of thinky thoughts bubbling in my head about urban fantasy, cities and visibility of women. Though, apart from the issue with forgetting women authors, it was a good panel with some intriguing points made and the panellists were excellent. I also made it to the Time Travel panel; the Mythology and Fairy Tales panel; the Writing LGBTQ+ Characters in SFF talk by Laura Lam; the Rule 63: Gender and subversion in History, Popular Culture and Fandom panel; the ‘It’s A Man’s World…’: Where Are The Women In The Creative Industry? panel; the Looking Backwards panel, which was a cool history thing; and the podfic vs podcasts thing – which I somehow managed to not realise would be about fan fic, despite the fact it was in the fanfic track! But it was a fun one, and very interesting. And I may have gone a bit mad shopping in the dealer room. And that’s before the post-con book binge of buying up stuff recommended on panels and mentioned by lovely random people. And talking of people, I saw many, in that ships that pass in the night kind of way, and big hugs to Alasdair and Marguerite and Adrian and Adele and Ian who were particularly lovely and made the con just that bit better! Definitely need to book up for next year. The Post WFC 2013 Post! 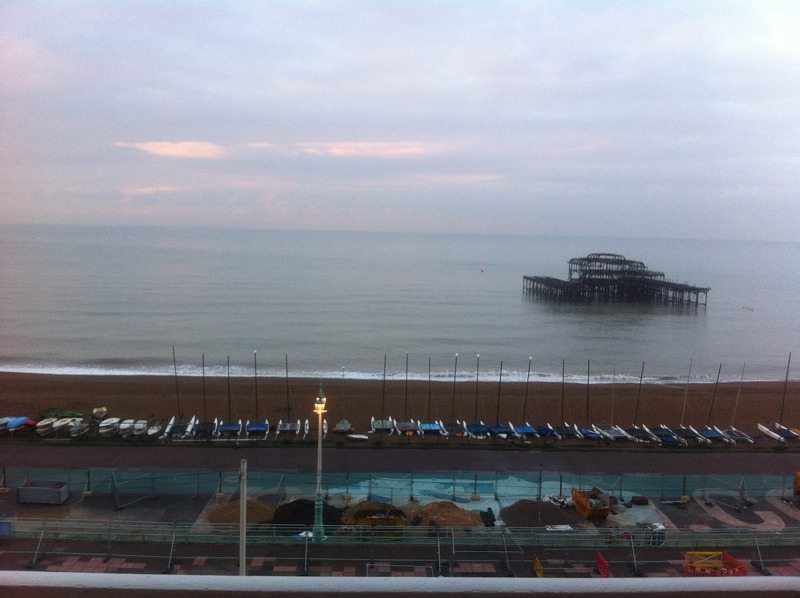 View from my window – the only bit of Brighton I saw! 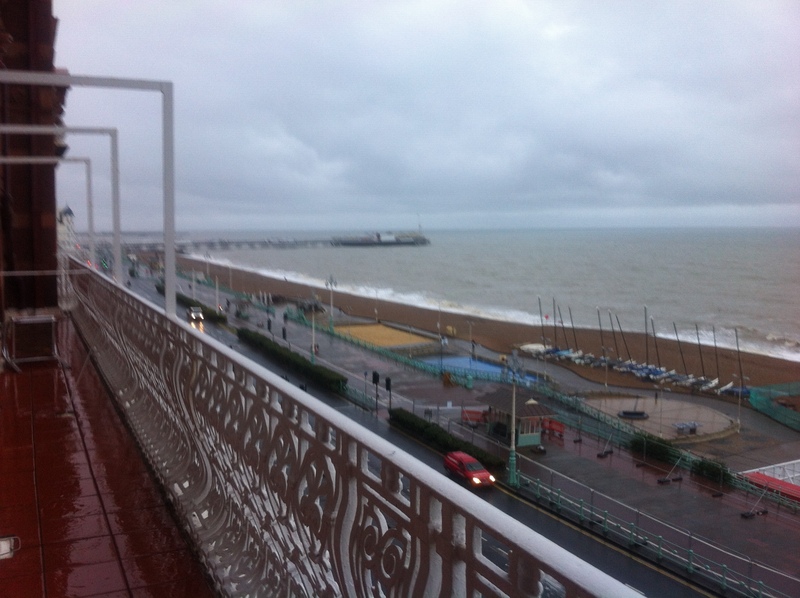 Well, except for this bit of Brighton, also seen from my window! If you squint you can see the pier in the distance! And the mass of people we saw through the doors added heaps to the buzz of the thing. (Is it weird I actually liked being swamped on the Reg Desk. Over 1400 people we checked in! 1400!!! Egads! And most of them on Weds & Thurs! I seriously could not even stand up, let alone walk both those nights.) We’ll pass quickly over that thing where I checked in one of the GoHs and completely missed the fact that they were one of the GoHs. Or the famous SF author of very long standing who I totally didn’t recognise at all and who was very amused when I asked him his name and couldn’t quite believe I was seriously needing to be told. Or the well known ghost story anthologist who I got chatting to about anthologies without realising who he actually was. Um, yes. Brain went splat many times. And one of the perks of Reg Desk duty is getting to say hi to the many-many folks I follow on twitter and facebook and various blogs, though in the rush of the check in, mostly all I could manage by way of conversation was something like ‘oh, you’re X, brilliant/awesome/excellent!’ which possibly saved multiple bouts of fangirling and ‘OMG! I loved your story/book/blog post!’ followed by the inevitable utter panic that goes with total brain-freeze as I then forget everything I ever knew about why they’re awesome. And doing the FT party introduced me to the merits of chairs! Which there weren’t any of. Which there really needed to be as there was no way I was going to be getting up again if I sat on the floor like many other people did. Luckily there was this little stage thing that was perfect for perching on… But yes, con organisers of the future – more chairs please! Many more chairs. Whole rooms of them. Chair-con! That’s what we need! And if you want to take a gander at what else went on, the inexhaustable Stephen Theaker has compiled a list of pre and post WFC reports on the BFS forum here.